ViaFluor® SE Cell Proliferation Kits use amine-reactive dyes to covalently label cells throughout the cell cytoplasm and intracellular compartments. Cell proliferation dyes are commonly used to monitor cell division by flow cytometry. The dyes also can be used to stably label cells to image cell morphology, or to track cell populations in mixed co-culture experiments. Labeling is covalent, so it withstands fixation and permeabilization for subsequent immunostaining. The membrane permeable compound is non-fluorescent until it enters viable cells, where it is hydrolyzed by cytoplasmic esterase enzymes to releases the fluorescent amine-reactive dye. The dyes then covalently react with amine groups on intracellular proteins, forming fluorescent conjugates that are retained in the cell, while excess unreacted dye is washed away. 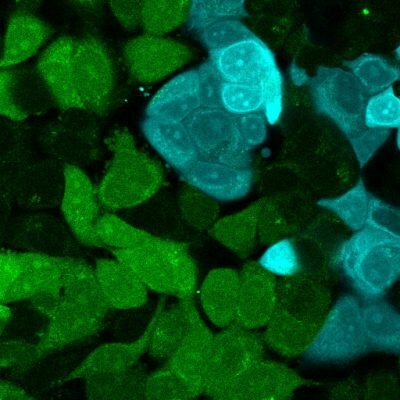 Immediately after staining, a single, bright fluorescent population will be detected by flow cytometry. With each cell division, daughter cells inherit roughly half of the fluorescent label, allowing the number of cell divisions that occur after labeling to be detected by the appearance of successively dimmer fluorescent peaks on a flow cytometry histogram compared to cells analyzed immediately after staining. 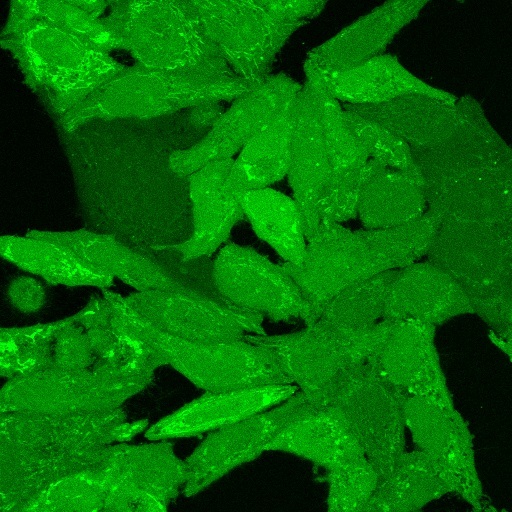 Thus, cell proliferation dyes can be used to track multiple cell divisions of cells grown in culture or injected in vivo after labeling with the ViaFluor® SE dye. All three ViaFluor® SE dyes can stain gram-positive bacteria, but not gram-negative bacteria. ViaFluor® CFSE stains the cytoplasm in yeast, but ViaFluor® 405 & ViaFluor® 488 stain the yeast cell periphery. See our Cellular Stains Table for more information on how our dyes stain various organisms. ViaFluor® SE dyes also can be used for imaging cell morphology or identifying cells in co-culture by microscopy. Because the staining is non-toxic and well-retained, it can be used for imaging live cells over time. See our Tech Tip: Using ViaFluor® SE Stains for Cell Tracing and Co-Culture. 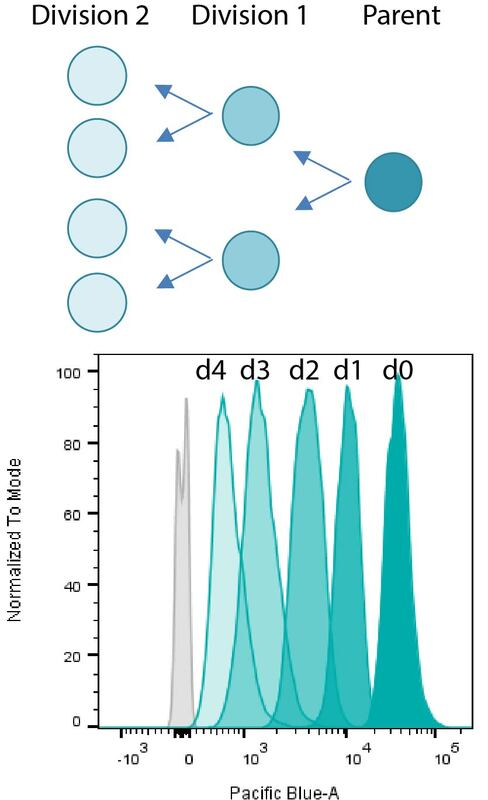 When used at 1 uM in 1 mL of cells, at a cell density of 1 x 106 cells mL, each dye vial can be used for 90-100 labelings; the final number of assays that can be performed per kit depends on the dye concentration used (see product protocol under downloads). ViaFluor® CFSE (also known as CFDA-SE) can be detected in the FITC channel. ViaFluor® 488 SE, an improved alternative to CFSE; detected in the FITC channel. ViaFluor® 405 SE for the violet laser; can be detected in the Pacific Blue® channel. Please note that ViaFluor® 568 (Cat. # 30080) has been discontinued as of 12-15-17. Pacific Blue is a registered trademark of Thermo Fisher Scientific. Flow Cytometry Fixation/Permeabilization Kit contains optimally formulated buffers for fixation and permeabilization of suspension cells for immunofluorescence staining of intracellular antigens for analysis by flow cytometry. Note: the fixation buffer in this kit is prepared from methanol-stabilized formaldehyde. For methanol-free fixative, see our Paraformaldehyde, 4% in PBS, Ready-to-Use Fixative. Easily label your antibody with phycobiliproteins APC, R-PE and PerCP, or tandem dyes APC-CF®750T and RPE-CF®647T, in about 4 hours. 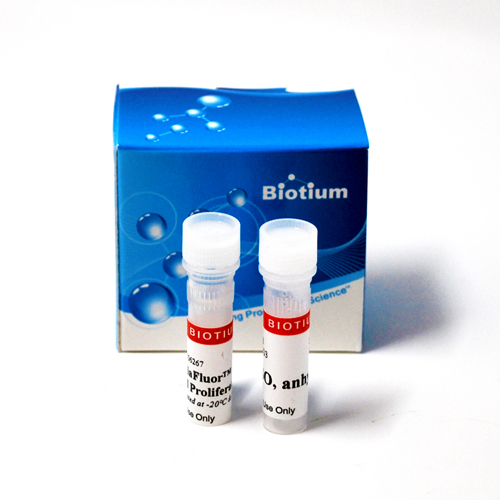 The labeling procedure tolerates many common buffer components and antibody stabilizers.